When it comes to planning in case of disaster, there are more than just a few things that you have to take into account. Moreover, if you have a dog, you have to take care of him or her properly as well. Disaster preparedness doesn’t mean that you just have to know what to do when something bad happens. More important than knowing what to do is making the necessary planning and preparations up until the moment disaster strikes. Today we’ll be talking about how to prepare for a disaster if you own a dog, as our pets’ lives matter as much as ours. When disaster strikes, your dog is most likely to get scared and run away, especially when you open your front door and try to get yourself to safety. This is where identification comes in handy – unlike you, your dog can’t run to the nearest police station and check in safely, so to say. Therefore, this is one of the first things you have to make sure your pet is equipped with. Your pooch probably wears a collar that has an identification tag already, but these collars tend to fall off, and the tags can fade. They make up a good identification method, but not a completely reliable one. That’s why, if you want to easily find your dog in case you lost him or her, you should add a microchip on your to-do list. As soon as someone finds your dog and scans the microchip, that person will be provided with all of the information required for them to return your pet to you safely. As soon as disaster hits and you are in a safe enough place, you’ll want to find a shelter for you and your dog. Naturally, the first thing that will come to your mind will be a hotel or a similar type of accommodation. However, not all of them allow pets inside their premises. So, if you don’t want to waste any time and roam around the city looking for the proper shelter, you should have a list of the pet-friendly shelters in your town. It’s important that you get your dog in a safe, calm location as soon as possible, in order for him or her to rest and recover from all the rush that took place during the disaster – you can bring some dog calming treats with you if your pet gets nervous quickly. Furthermore, you should also have a list of the pet boarding facilities in your town – as you will want to return to your home after things calm down and determine the amount of damage that has been done. In short, make sure that you have a place that can accommodate both you and your dog but one that is able to shelter only your pet as well. 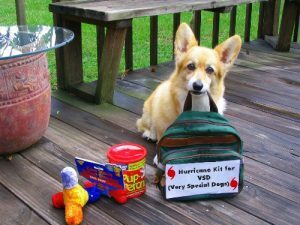 This one thing on our list for disaster preparedness is pretty much straightforward – if you are going to prepare an emergency kit for yourself, then you must have one prepared for your dog as well. You can never know what will happen during a disaster and you might be left without any access to most common facilities, both for you and for your pet. That’s why it is essential for you to be always prepared with such an emergency kit. 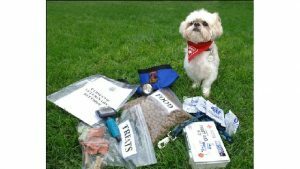 The basic emergency kit for your pet should contain water, treats – obviously, you always need dog treats hanging around -, water, collars, extra leashes, blankets, even some poop bags in case your dog gets scared after the events, crates or carriers, a couple of identification tags in case the one he or she is currently wearing goes missing, and veterinarian information – you can also add a couple of dog life jackets, depending on the disaster type. As mentioned before, you will want to have a list of all the possible accommodations that can shelter you and your dog. However, in the event that your pet gets injured, you’ll want to know all the emergency veterinary facilities in your town and where they are located as well. Of course, you might just go to your pet’s usual veterinarian, but keep in mind that, in case something bad happens, this kind of facilities might get filled up relatively quickly – therefore, you’ll want to have information about as many of them as possible so that you know where to take your dog next if you bump into a waiting list. We all know that, in case of disaster, things can get quite tense and happen very fast – therefore, there’s the chance that your dog might be left behind inside your house, with no way of getting out. The pet can and probably will get very scared and will go hide in the safest spot he or she knows – and you’ll have a hard time getting your dog out of there. As your safety is of paramount importance, it is recommended that you do not get back inside your home and look for your dog. For example, in the case of an earthquake, there might be several replicas that can further endanger your life. In this case, it is best to have rescue stickers in the most visible spots outside your house. These are recommended by the ASPCA so that neighbors or rescue workers know how many and what type of pets are inside the house. This will greatly improve the chance of rescue and, therefore, survival of your dog – especially when paired with the identification tags and microchips. 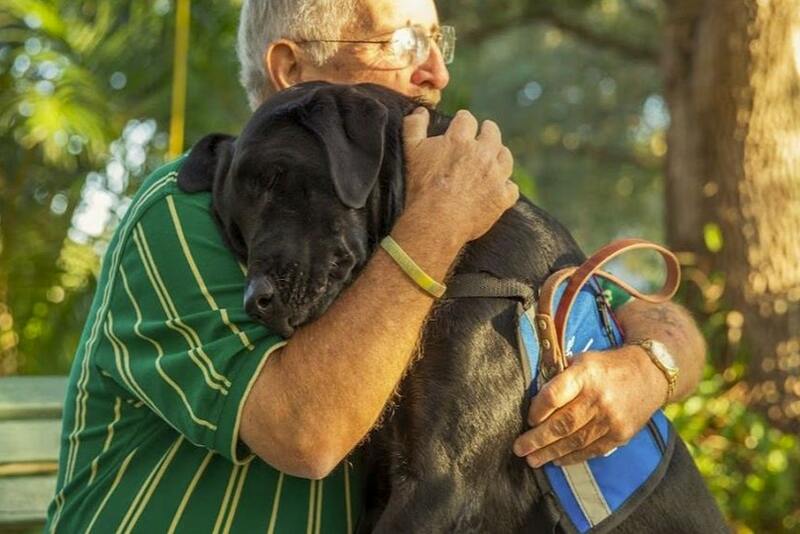 These two things only can ensure you of the fact that you and your pet will be reunited.